This is a day hike or short overnight trip. The reason that this hike is in my list of favorites is because of how beautiful it is in the Fall, when the leaves are turning. 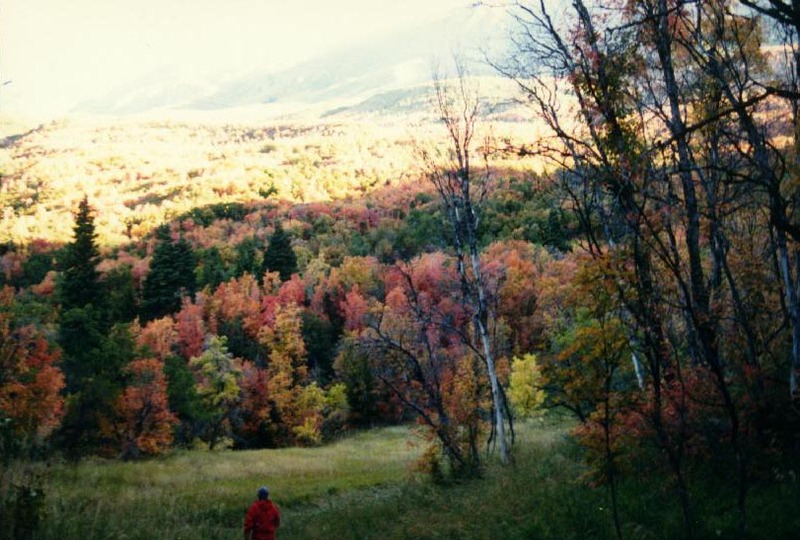 At other times of the year it is pleasant enough, but in the Fall, this hike is spectacular. I grew up in Virginia, where the Fall leaves along the Skyline Drive are justifiably famous for their beauty. I've also seen beautiful Fall color in Upstate New York, and the golden aspen leaves in the Colorado high country. However, Battle Creek canyon is the best place I've ever been to experience the beauty and vibrant color of Fall leaves. Depending on the exact time of your trip, you will see either bright, almost flourescent colors or more muted tones, but it is always a worthwhile Fall trip. It is a very easy hike, and is perfect for kids. Battle Creek canyon is easily accessed from the town of Pleasant Grove, just North of Provo and Orem. There is a large water tower which sits at the trailhead. Drive up past Pleasant Grove high school to where the road terminates at a small city park next to the water tower. An easy trail leads up Battle Creek canyon. The trail passes by a small waterfall, which is a popular day hike/picnic destination. Rising gently for about a mile, the trail then levels off and eventually leads to easy terrain on the shoulder of Mount Timpanogas. There are numerous creeks and meadows, and a number of criss-crossing trails, game trails, old jeep roads and the like here. This is a great place to set up a campsite if you have come on an overnighter. Either return the way you came, or loop back around following the indian trail, dry spring trail and curly spring trail. Be warned, many of the trails here are indistinct and not easy to follow.